Shielded AEM® Instruments and Monitors eliminate the risk of stray energy burns in laparoscopy, from both intraoperative insulation failure and capacitive coupling. We guarantee it. In fact we believe in our AEM technology so much, we offer a legal contract to all of our customers in the form of a 100% hold harmless agreement. The agreement offers complete indemnity to any physician and/or hospital using AEM instrumentation, for stray energy burns to the patient. No other company in the world offers this type of guarantee for you and your patients. This is because no other technology eliminates stray energy burns to the patient. 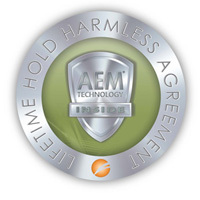 AEM instruments shield and actively monitor zones 2 and 3. These areas of the instrument are in contact with the patient and outside the physician’s field of view during a laparoscopic procedure. By actively shielding these areas from intraoperative insulation failure and capacitive coupling, Encision guarantees stray energy burns are eliminated. Contact Us to Schedule a Free Clinical Evaluation. This is a break in the instrument insulation, a defect beyond the control of even the most skilled surgeon. With the AEM® system, instrument insulation is monitored so that no instrument with a fault is used in surgery. Insulation failure occurs when insulation along the shaft of the active electrode breaks down and current ‘leaks’ from the instrument, burning nearby tissue. Insulation defects occur as a result of normal wear and tear, the stress of high voltages, the cleaning and sterilization process, and contact with other sharp instruments such as trocar cannula. The smaller the defect, the greater the hazard. Defects that are invisible to the naked eye can concentrate current density and cause severe burns to non-targeted tissue. An electrical phenomenon whereby current passes through intact insulation. In the event that this type of energy reaches dangerous levels, the AEM monitor interrupts the power by shutting down the generator. Capacitive coupling occurs when electrical current is induced from the active electrode to nearby conductive material through intact insulation. In electrosurgery, the charge on the active electrode switches from positive to negative at a very high frequency. The rapidly varying electrical field around the active electrode can transfer high levels of electrical current to non-targeted tissue, causing severe burns. The potential for capacitive coupling to occur is always present in monopolar electrosurgery.